Dr. Mark’s background and experience uniquely equip him to help leaders and aspiring leaders get to the next level in both the workplace and church body through seminars, retreats and workshops. This includes providing personalized support, customized tools, counsel and encouragement. His willingness and passion to come alongside and assist them to become all they can be in Christ is apparent. The church today is, in a sense, more powerful, influential and wealthy than ever before. Our pastors are better educated, technology & media tools abound, staff & outreach capacity surpasses any time in history. Have you ever wondered why, despite this, Christianity doesn’t have an unprecedented impact or even seem to make much of a difference? Clearly the church has yet to become a model for society let alone reach its redemptive potential. As individuals we are prone to become comfortably numb and even complacent. God has uniquely formed each of us in his image and yet this image has been marred, at minimum. His purpose in redeeming us is to make us more like Jesus. He intends to accomplish his purposes by revealing his ‘manifold wisdom’ through the church. He will ultimately restore his entire creation to become the most perfect universe. Often we struggle understanding God’s will for our lives while actually he has already made that clear; he has given us all that we need to become all we can be ‘in him’. 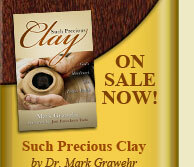 So why do we resist the Master Potter’s work in us and through us? Life’s inevitable challenges, difficulties and suffering can seem scary and painful; yet ironically they are exactly what can bring genuine peace and fulfillment if we reframe our present reality from God’s perspective. Understanding and embracing the Biblical Worldview does not come naturally—but it is essential! Christianity is more than a belief system whereby we ascend to a saving ‘knowledge’ to gain access to heaven. Faith is an action that involves surrendered obedience as God intended apart from the patterns of this world by the power of his spirit. Maybe you’re at a place where you and/or your church desire to get to the next level, and know that’s what God would have you do — but it seems out of reach. Maybe you are going through a challenging or difficult time, or know of a family member or friend who is, there are answers and resources available for you.